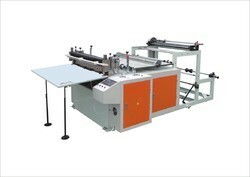 We are the leading manufacturer, supplier, wholesaler and trader of Sheet Cutter Machines to our valuable clients. Owing to our proficiency in this domain, we are engaged in offering our clients with a wide gamut of Automatic Sheet Cutter Machine. Our offered machine is manufactured by our skilled professionals using best grade raw material and latest technology in compliance with the industry quality standards. In addition to this, our provided fixtures undergo different tests under the supervision of quality controllers to make certain its flawlessness. Mainly used for cutting sheets that are used for making packing boxes, Clients can avail this machine from us in customized options and at market leading rates. Owing to our vast experience in the concerned industry, we are offering a comprehensive array of Semi Automatic Sheet Cutting Machine that is mainly used in packing industry. The entire range is designed using high grade raw material and the latest technology. We offer this machine in different models and other related specifications, designed to suit ever-evolving needs of our prestigious clients. Moreover, our offered machine is rigorously tested by our experts on distinct parameters, in order to deliver a flawlessness range at our client's end.